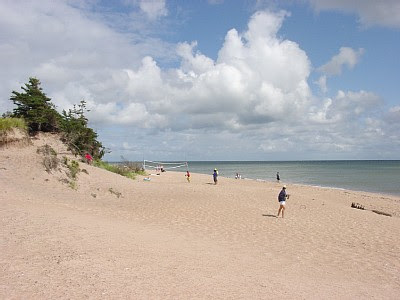 I love beach cottages and while searching for a family get away I found the lovely Lac de La Mer on Prince Edward Island in Canada! 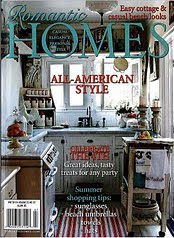 I immediately wanted to see more when the listing read "See Lac de la Mer in Country Living Magazine in July 2009." No need to wait until July; let's have a peek inside. 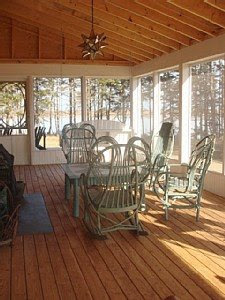 'Lac de La Mer ('Lake in the Sea') is a charming island beach house situated on beautiful private salt water lake on the southeastern ocean shore of Northumberland Strait in Canada. The main house has 5 bedrooms with water views, 3 1/2 baths , 2 fireplaces, 3 porches, designer bed linens, and time worn antiques. I like the red, white and blue color scheme. Very beachy, but not too kitschy. Classic black windsor chairs flank the farmhouse style table. Notice the red buffet chest - This is a great way to spice up a flea market find and make it a focal point. Another view shows the fireplace. Sisal rugs on floor add texture. I also really like the addition of the white twig rocker in the left corner. 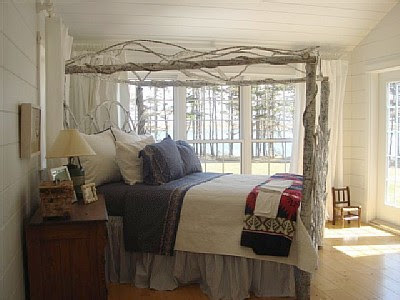 Interesting birch bed, a perfect choice for this little cottage by sea. 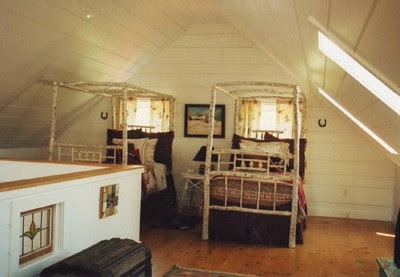 In the upper bedroom the two twins beds are birch as well. I know my children would enjoy this loft like room with tree house feeling. 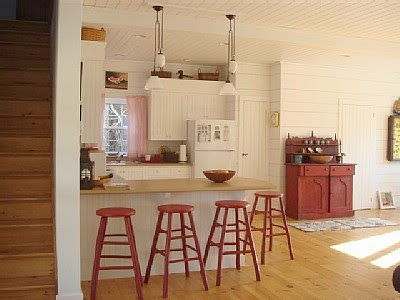 This photo also gives you a good view of the pine flooring. Look at the antique stained glass panels incorporated into the stairway design. Clever! I really like the red touches in each room. 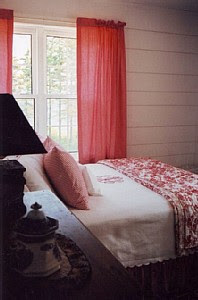 Here the red printed toile throw and cotton curtains carry the red scheme and help the rooms all flow together. The first of two screen porches. 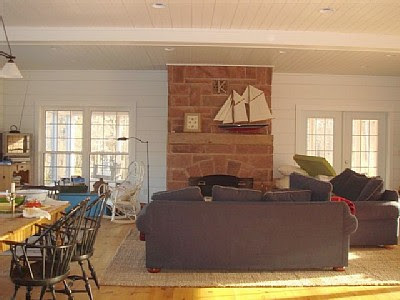 Here painted twig furniture in the adirondack style creates a wonderful retreat for a leisurely nap or crossword puzzle. 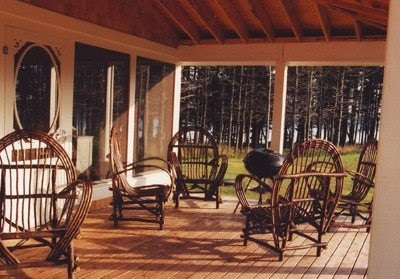 The second porch has more traditional twig furniture. You can see the lake just through the trees. This private island location on beautiful South Lake is close to the white sandy beaches of the ocean which is warmed by the Gulf Stream. Nearby is the East Point Light House, Basin Head, the North Lake Harbor, and seal and whale watching. More information can be found at HomeAway. Very rarely do you find a rental property that such a warm and lovely decor - that feel as if an old friend of the family just left you the keys for the weekend. No wonder Country Living was interested!! That is a truly lovely beach cottage. Are you going to go? I'm not sure I'd want to leave. This place is wonderful! 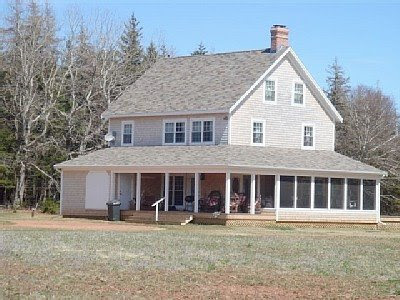 It is so unusual for a rental - Can't wait to get my July Country Living. thanks for the great tour. Nice find. That is a beautiful beach too. What a fun place to stay - it looks like the kind of place you could return to year after year and never get tired of it. I also really liked the web site you found it on. A great way to search for a family retreat. i hope you go. it looks like a dream. the house will be a joy to hang out in and write!! you are bringing the laptop and internet , aren't you ?? How does one leave once arrived?? Impossible. What a fabulous place to have a family vacation. I hope this is where you get to go! 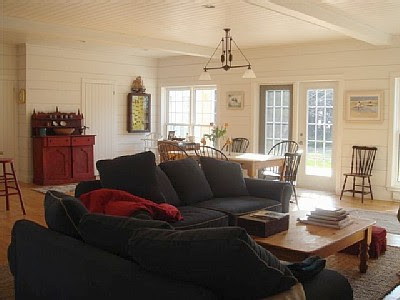 This rental home is beautiful... the twig furniture is so charming, and the house looks so welcoming and relaxed. ack..how wonderful! I'll be packed and ready to go in five minutes. :) Looks divine. What a beautiful blog you got! Canada in the summer is beautiful, so is the lakehome. What a wonderful and sweet cottage! And the whole island setting is so romantic!! Are you going to take it? I'd love to wake up in that whimsical birch bed and look out over the water - and have coffee on that porch! Have a wonderful weekend, Gina! 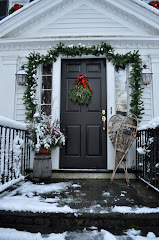 Great post, simple and beautiful!! Mon ami Gina, Lac du mer est belle. Merci pour des photos et de l'histoire. Sorry I missed you at Brimfield. I'm also sorry you did not make it on opening day-I pretty much sold out on opening day! It was a fantastic show and by the time you got to my booth it was "leftovers." You met my daughter, Aichun(her name means "love exists in Mandarin.) Although developmentally disabled, she is a great help at Brimfield and at my shop. Did you get any treasures??? Sign me up! There couldn't possibly be a more dreamy place to go! Looks like a gem you uncovered. Wish I could go!